Imagine's risk platform is recognized for market leadership. 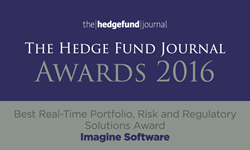 For the second consecutive year, Imagine Software has been named the "Best Real-Time Portfolio, Risk and Regulatory Solutions" firm by The Hedge Fund Journal. The award was announced at the January 27th celebratory dinner in London. "We are delighted to be honored twice in this category by The Hedge Fund Journal. It reflects our twenty-two year commitment to providing real-time solutions that solve our clients' evolving risk and regulatory challenges," said Scott Sherman, an Imagine Co-Founder and the Global Head of Business Development and Sales. "We selected Imagine for this award because of their continued commitment to helping financial professionals readily adapt to market and regulatory changes," said Rod Sparks, Publisher of The Hedge Fund Journal. Imagine Software, founded in 1993, provides real-time portfolio, risk management, and regulatory solutions for the world's leading brokerage firms, investment banks, hedge funds, and funds of funds in more than twenty-five countries throughout the Americas, Europe, and Asia-Pacific regions. Imagine provides institutional-grade functionality and broad cross-asset instrument support for businesses of all sizes and complexity. Imagine was the first to launch a cloud-based portfolio and risk management system in 2000, making it easier for clients to access, customize, and use the firm's extensive analytics and products. Headquartered in New York City, Imagine has offices in Hong Kong, London, and Sydney. For more information, visit http://www.imaginesoftware.com or contact Imagine Software at 212-317-7600, and follow us on Twitter and LinkedIn.